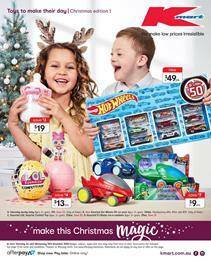 Top Christmas toys by Kmart Catalogue is in the first 10 pages. You have the best prices of LEGO sets. Lego Juniors, Jurrasic World, Duplo sets are available on pg 11. Buy Duplo Jurrasic T-rex tower for only $35 at Kmart. More toys are available there. For example, Meccano 25 in 1 motorized card will cost $55. Visit pg 11 for that toy. Kmart's price for toys on pg 10 is only $20. Find Lego city, Ninjago, City and more sets on that page. See pg 8-11 for the major deals on LEGO products on the Kmart Catalogue. Most of them are exclusive toys. Find new products on pg 6&7 where Scentos scented stationery activity set, The Fairy Kingdom Christmas elf door set, So Slime DIY factory are the new products. Home furniture toys are usual things you find in any Kmart Toy catalogues. You can also save a lot on plush toys that are available on pg 4-5. Some of them are only at Kmart and big savings are waiting for you in the new catalogue. Kmart has early Christmas toy selection consisting of Laser X, Luvabella, Lol surprise, PJ Masks, and more products. To see them, you can check out the pg 2-3 and learn their prices.